Stompy Bot Productions will continue crowdfunding on its website as it reevaluates its strategies. Heavy Gear wasn't just that other mech game, for some it was the superior one. While Mechwarrior's bots were imposing walking tanks, Heavy Gear's nimble machines could skate, lay prone, or walk on the outside of space cruisers. It only had two PC games back in the 90's, and Stompy Bot Productions thought it was about time the franchise had another installment. Yet, after earning only $45k of its $800k Kickstarter goal with one week to go, it has decided to cut the crowdfunding campaign short. Stompy Bot made the announcement via an update on its project page: "Thank you for your dedicated support. We appreciate and highly value everyone's opinions here which is why we have decided to cancel this KS campaign and continue crowd funding on heavygear.com." While the game isn't dead, its fate is less than certain. As the update continues, "we believe very strongly in resurrecting the Heavy Gear franchise and giving the fans what they want. We are currently evaluating other strategies to raise awareness regarding Heavy Gear and looking at multiple means to get the Heavy Gear name out there. Thank you for your support everyone and stay tuned." Built in Unreal Engine 4, Heavy Gear Assault is aimed at PC, Mac, and Linux systems. It mostly focus on multiplayer battles, with an iOS app allowing players to spectate on matches from the stands and even earn cash on the side by sponsoring players. The Kickstarter was intended to fund the first episode of the single-player campaign, with additional episodes added as stretch goals. 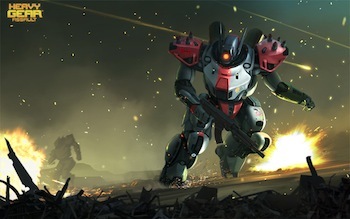 The developers also hoped to include Oculus Rift support, which would have simulated an entire mech cockpit.